Western Segment – Envisioned as one or more multi-modal connections around and/or through the Santa Monica High School campus and Santa Monica civic center, to the beach. Central Segment – Envisioned as a place-making neighborhood-oriented streetscape enhancement area along Michigan Avenue. Improvements may include traffic calming, sidewalk and open space enhancements, new lighting, landscaping, and/or new bike facilities. Eastern Segment – Will create a new multi-modal connection across 20th Street, eventually linking to Stewart Street. The Wiggle – Envisioned as a place-making neighborhood-oriented streetscape enhancement area that “wiggles” from Michigan Avenue to Delaware and Virginia Avenues and up to Stewart Street. Similar in character to the Central Segment. 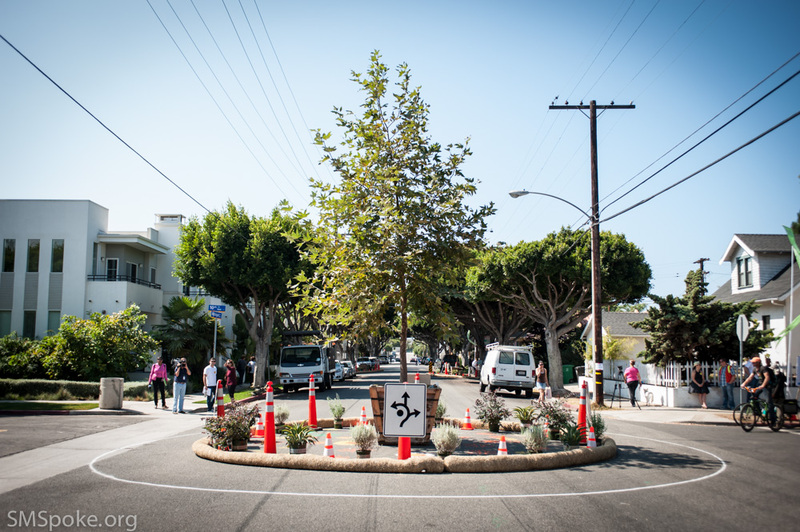 The Michigan Avenue Neighborhood Greenway will create an inviting shared street space along Michigan Avenue and adjoining streets within Santa Monica. The “Greenway” concept was born from the City’s Land Use and Circulation Element and Bike Action Plan, and it will prioritize pedestrians and bicyclists along the corridor. The three-mile greenway will provide residents and visitors with a safe and comfortable place to walk, interact with neighbors, play, travel, and be. It will connect the community to key destinations and neighborhoods. The greenway will also improve the mobility and accessibility through the Pico Neighborhood. 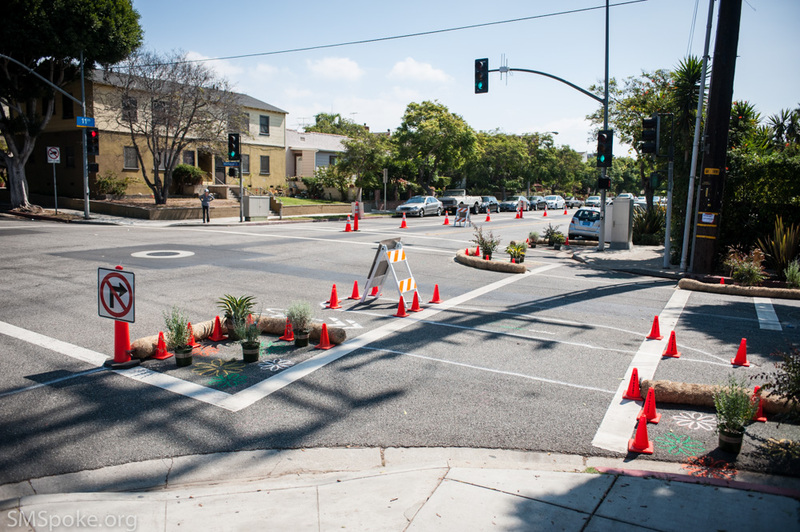 Proposed improvements will favor local automobile trips over cut-through traffic, which is better suited for the major thoroughfares flanking Michigan Avenue to the north and south (Pico and Olympic Blvds). With the arrival of the Expo Line in 2015, the greenway would provide a link from the neighborhood, to new Expo stations and some of Santa Monica’s most significant attractions – the beach, downtown Santa Monica, the Civic Center and Bergamot Station. The Michigan Ave Greenway would also provide safe a link for kids to walk or bike to many of the local schools. Additionally, the greenway would offer a key connection to the broader bicycle network both in the City of Santa Monica and to the surrounding Los Angeles region. 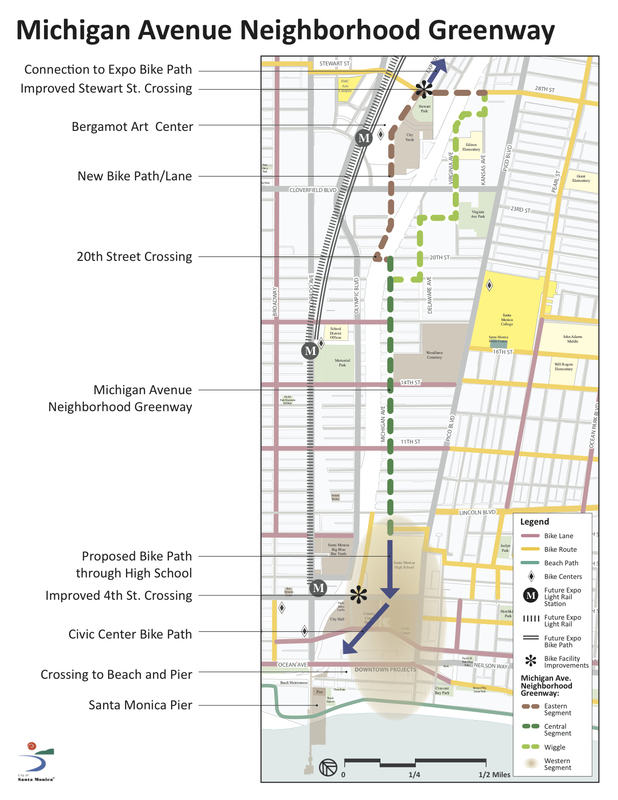 The greenway – currently in its initial phase of planning – consists of four segments through the City of Santa Monica: Western, Central, Eastern and the Wiggle. The City and Consultant Team will host this last Community Meeting to go over the concepts and plans for the Michigan Ave Neighborhood Greenway: MANGo! Whether you have participated in the past or this is your first view of the project – we urge you join us to provide needed support for the project with your attendance and input. This is the last public community meeting scheduled on the project before it is presented to Council on February 11. 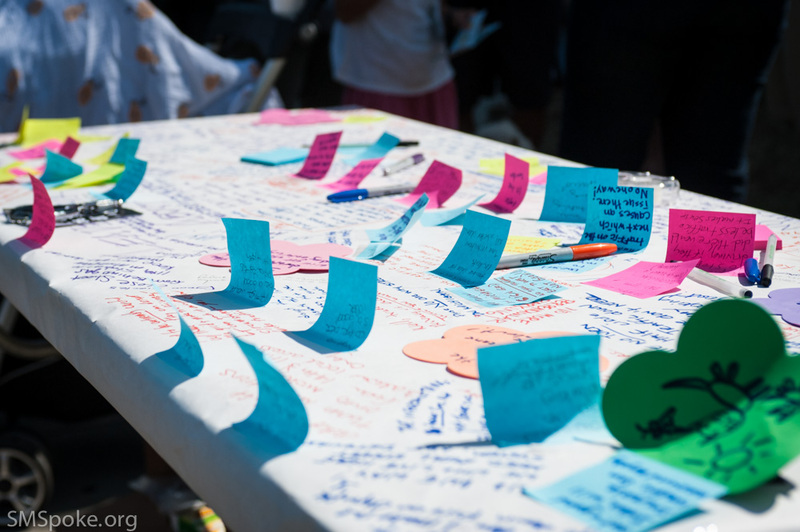 We would like to invite you to join us in support of this major community investment and hear first hand the benefits and concepts it proposes for the Pico Neighborhood, place making for people, connectivity for bikes and a grand benefit our Community at large. Jason from the City of Santa Monica and Amber from the consulting team gave a presentation summarizing the project and the results of the POP-UP MANGo event at each of the last 2 meetings. It was suggested at the December 9th meeting that the city may be considering turn restorations instead of traffic diversion at 11th & Michigan Ave. The small yet vocal contingent in PNA gave a brief talk of on a survey they circulated against any traffic diversion and Barbara Filet (who lives on Michigan Ave) gave a brief talk on her results of the same survey that overwhelming supports traffic diversion. This survey which has no explanation of what traffic diversion is, how it could be accomplished, or its intended results – (how ever well intentioned) we considered flawed and biased and against any traffic diversion even to test – I believe these opposing results support our claim that the survey is biased and we should put more weight on the results collected at MANGo by the professionals tasked to collect informed and balanced community input. A least a couple people at the 12/9 meeting thought the different results of the surveys collected by PNA and BF raised questions about the validity of the survey. There were at least 2 marketing professionals at the meeting that agreed the survey is flawed. There was a good attendance by the local bike community. Grace Phillips of Bike it Walk it & SM Walks, made the point that the city and council should prioritize public safety and health above the convenience of drivers. Dr Scott Reiter (SMSpoke) spoke out for public health and safety – GO Scotty! Barbara Filet gave a great pitch for the necessity of creating a safer Michigan, and the dream she found many share – to see Michigan Ave become a true asset for the community. Kent Strumpell spoke and praised the set of options the city had identified, including diversion. He voiced his satisfaction of the pop-up MANGo event and how this gave people a chance to actually see the proposed modifications, ask questions and learn about them and how polling at MANGo found 55% support for diversion. Oscar de la Torre (PNA & School Board) spoke in support of finding solutions and collaboration – possible traffic mitigations could be coordinated with SRTS planning around SAMOHI – like more drop off zones (on Olympic Dr). Also resurrected conversations about replacing the 7 Street bridge across the 10 FRWY – but at best that is a ways off. A few sparks did fly as those in opposition to traffic diversion are taking our challenge to their survey and input to support to al least test traffic diversion as attacks on them personally. We invite you to join us, City Staff and our special guest, Santa Monica’s former Mayor, Assemblyman Richard Bloom who will give an update about regional Bike Share, Santa Monica’s leading roll and his commitment and leadership for a successful and truly regional system. 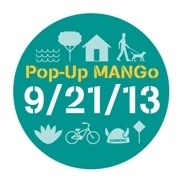 Also we will get a peek at initial results from MANGo Pop Up Greenway, first event of its kind in the region (Michigan Avenue Neighborhood Greenway project). Presentations on projects aimed to create more livable streets and improve the environment for pedestrians and bikes. Get inofrmed and give your input on prioritizing and projects that are important to you at anytime during the meeting via post it and written ballots. We will invite the SMPD bike liaison to attend who can address questions and clarification you may have regarding enforcement and ticketing. From the Bicycle Action Plan (BAP) approved by City Council this November 2011. Help us shape this project and make it a reality. The Michigan Avenue Neighborhood Greenway project generally runs along Michigan Avenue with a beach connection on its west end and various separated bike path or shared use path connection on its east end. The bikeway would carry cyclists between the beach and the Civic Center on Arcadia Terrace or Pacific Terrace, and crossing Ocean Avenue to a new street connection with a two-way side path on the north side of Olympic Drive to 4th Street. The two-way side path continues eastbound on the south side of EB Olympic Boulevard to 7th Court. Shared lane marking facilitate bicycle travel along 7th Court and eastbound on Michigan Avenue to the cul-de-sac at 19th Court, connecting to an improved and widened bicycle and pedestrian access way to 20th Street. A new two-way path along the east side of 20th Street and the north side of I-10 will close the existing gap on Michigan Avenue (created when I-10 was constructed) from 20th Street to 21st Street. An eastbound bicycle climbing lane (potentially operating as a contraflow lane) between 21st and 22nd connects to buffered bike lanes between 22nd Street and Cloverfield. East of Cloverfield Boulevard, bike lanes complete the connection along Michigan Avenue to Bergamot Station. If traveling to the Expo Light Rail Station at Bergamot Station, cyclists would be guided across the existing parking lot with shared lane markings. If continuing eastbound, cyclists would travel along a new bicycle and pedestrian shared use path connection along the City Yards property line to Stewart Street. The segments along Michigan Avenue between 7th Court and 19th Court will be supplemented by neighborhood greenway treatments such as neighborhood traffic circles, bicycle access enhancements, and branded wayfinding indicating destinations and distances to destinations. 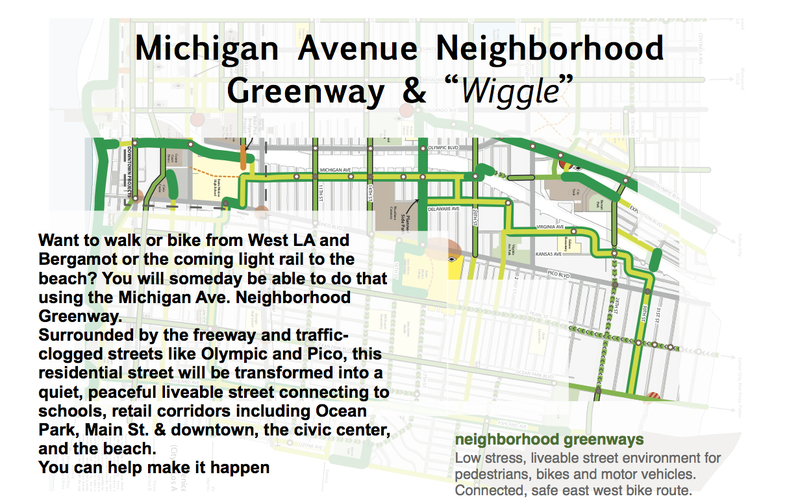 The aptly named Michigan “Wiggle” Neighborhood Greenway, named for its meandering route, is a low stress, low volume and low speed bicycle facility that provides a connection between Downtown via the Michigan Bikeway and the Ocean Park neighborhood in southeast Santa Monica. This neighborhood greenway would be designed for safety and network legibility. The Wiggle never continues on one street for more than a half-mile segment. Running from west to east, the neighborhood greenway is routed along 19th Street between Michigan and Delaware Avenues, Delaware Avenue between 17th Street and 22nd Street, 22nd Street between Delaware Avenue and Virginia Avenue, and where Virginia Avenue terminates into 27th Street. From there, the route heads east up Kansas Avenue to Yorkshire, meanders through Urban Avenue, Dorchester Avenue, and 30th Street until it connects with Ocean Park Boulevard. The entire route is enhanced with shared lane markings due to its low volume character. All segments along the Michigan Wiggle Neighborhood Greenway would be supplemented with wayfinding signage that identify the bikeway and indicate destinations and distances to destinations. In addition, vehicle speeds along several segments should be managed with design features such as speed humps and neighborhood traffic circles. No striping or parking removal is needed and installation can occur immediately.